Buy CritRoleStats a coffee. - Ko-fi ❤️ Where creators get paid by fans, with a 'Buy Me a Coffee' button. Hey Critters! 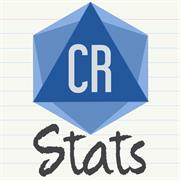 Crit Role Stats has been another full-time job for all of us. While it's definitely a labor of love, we still appreciate any support you can pass our way. Thanks for being awesome, either way! Secured Payments. Support goes to CritRoleStats's account. Upgrade CritRoleStats to a yearly Gold Membership with a one-time payment.